Boasting sharp looks that ensure this car won't pass unnoticed, the Toyota Avensis is a mid-sized executive saloon with plenty of space on offer and a comfortable interior. You'll enjoy low running costs, punchy performance and a car that cruises with ease. 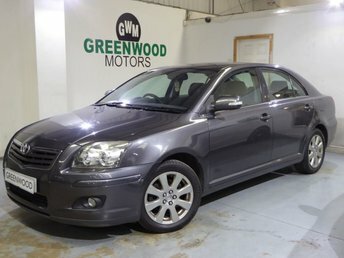 Why not inspect one of the used Toyota Avensis models for sale in Bradford today and find out whether this good-looking saloon is the right model to suit your lifestyle and budget. Contact the team at Greenwood Motors Ltd and we'll help to arrange a test drive. Rest assured that all of our used vehicles come fully inspected, meaning you can buy from us with complete confidence. Start your search here on the website today. Finance is available to UK residents aged 18 years or older, subject to status. Terms & Conditions apply. Indemnities may be required. Other finance offers may be available but cannot be used in conjunction with this offer. We work with a number of carefully selected credit providers who may be able to offer you finance for your purchase, commission may be received. We are only able to offer finance products from these providers. Postal Address: Greenwood Motors Ltd, Unit 1 & 2 Brownroyd Business Park, 3 Duncombe Street, Bradford, West Yorkshire BD8 9AJ. Find contact details here.